As far as world beaches go, apparently many out there choose Cancun as the choice of beach getaways for Summer 2013. According to Orbitz the No. 1 international Summer beach hotspot is the legendary Spring Break destination in Mexico. Mexico and Central America are not only heating up temperature wise this Summer, but visitation wise. For the bored or down and out traveler out there, how about “inspirational travel” this Summer season? You don’t know what inspirational travel is, you say? Well, a company called Beach Tomato has launched a new online portal to inspire, and to help satisfy your wanderlust for sandy, seashore, and sunshine bliss this year. 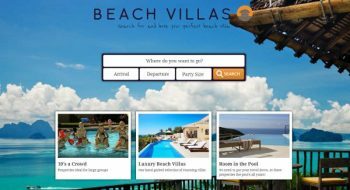 BeachTomatoVillas.com is a wide eyed beach stay showcase. Let’s look. TUI Travel PLC’s CEO talks about what’s to come in 2013, as well as profitably for 2012. There’s a lot to be said for TUI, sunshine, and smiles – out of the gloomy forecast, some TUI brightness appears to shine.